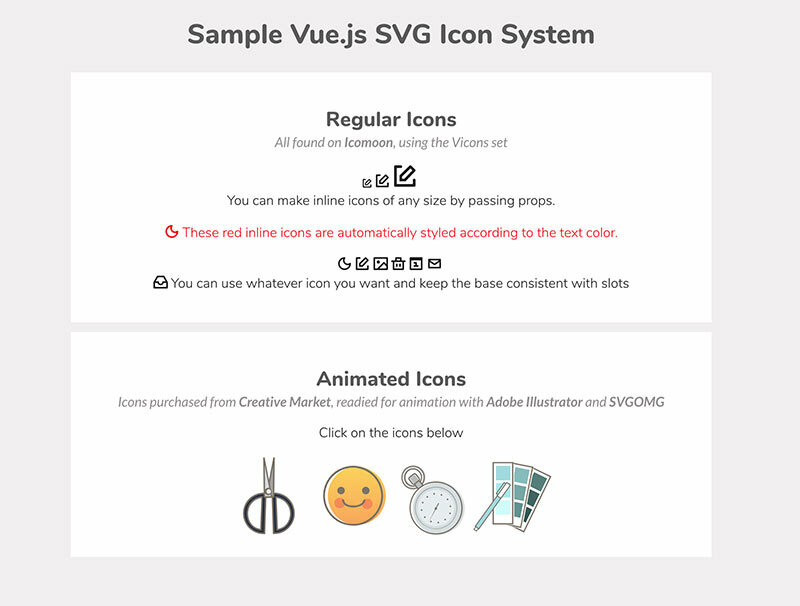 We’ll create a base icon (IconBase.vue) component that uses a slot. You can use this base icon as is- the only thing you might need to update is the viewBox depending on the viewBox of your icons. In the base, we’re making the width, height, iconColor, and name of the icon props so that it can be dynamically updated with props. The name will be used for both the <title> content and its id for accessibility. The currentColor property that’s the default on the fill will make the icon inherit the color of whatever text surrounds it. We could also pass in a different color as a prop if we wish. We’re applying refs to the groups of paths we need to move, and as both sides of the scissors have to move in tandem, we’ll create a function we can reuse where we’ll pass in the refs. The use of GreenSock helps resolve animation support and transform-origin issues across browser. See the Pen Editable SVG Icon System: Animated icon by Vue (@Vue) on CodePen. Pretty easily accomplished! And easy to update on the fly. Designers may change their minds. Product requirements change. Keeping the logic for the entire icon system in one base component means you can quickly update all of your icons and have it propagate through the whole system. Even with the use of an icon loader, some situations require you to recreate or edit every SVG to make global changes. This method can save you that time and pain. This type of SVG icon system is really useful when you have a number of icons that are used in different ways throughout your site. If you’re repeating the same icon many times on one page (e.g. a giant table a delete icon in each row), it might make more sense to have all of the sprites compiled into a sprite sheet and use <use> tags to load them. These tools bundle SVGs at compile time, but make them a little harder to edit during runtime, because <use> tags can have strange cross-browser issues when doing anything more complex. They also leave you with two nested viewBox properties and thus two coordinate systems. This makes the implementation a little more complex.